U.S. Employment Up But Not Enough, World Slips into Recession As Central Bankers Unite! The headline number is that 120,000 new jobs were created in November, in line with estimates. That total is the sum of 140,000 jobs from the private sector coupled with the now usual loss of 20,000 jobs in the government sector. But when we look at the details, things are not as upbeat. First, the good news: the US economy is continuing to grow. As I have said for quite some time, the US should not fall into a recession unless it is pushed by something from beyond our shores, which, sadly, I expect (details below). However, we are nowhere near the typical recovery pattern. By this time into a recovery we are usually making new highs on the employment front. As everyone knows, we are millions of jobs from that level. The net change in employment per firm wasn't much different from zero, but it did have a plus sign in front of it for the first time in nearly half a year. On average, owners reported increasing employment an average of 0.12 workers per firm. Seasonally adjusted, 14 percent of the owners added an average of 3 workers per firm over the past few months, and 12 percent reduced employment an average of 2.9 workers per firm. The remaining 74 percent of owners made no net change in employment (47 percent hired or tried to hire and 35 percent reported few or no qualified applicants for positions, both figures up 4 points). The percentage of owners cutting jobs has returned to "normal" levels (even in a great job market, over 300,000 file initial claims for unemployment, i.e., they are fired or laid off). And the percentage of owners adding workers (creating jobs) continued to trend up. Reports of new job creation should pick up a bit in the coming months. 120,000 jobs is not quite enough to keep up with the growth in the population. Along with positive revisions to previous months, we have now averaged about 114,000 a month for the last 6 months. But then why did the headline unemployment number fall to 8.6%? That is a very large drop for one month. The simple answer is that the number of people looking for a job fell by 315,000. And the number of people counted as not in the labor force (a different measure) swelled by 487,000 to a record 86.5 million. Again, for new readers, you are not counted as unemployed if you have not looked for a job in the last four weeks. 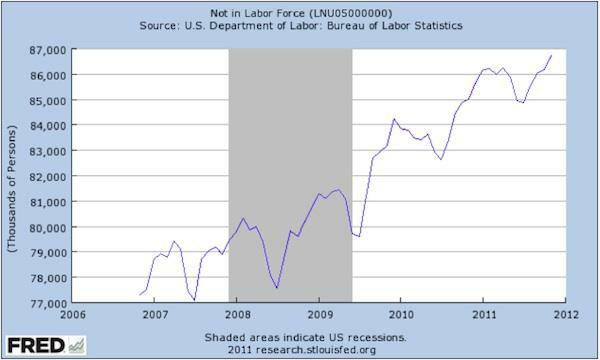 Let's look at a chart from the St. Louis Fed database that shows the number of citizens not in the labor force. What we see is a rise from 77 million in 2007 to 86.5 million today. Part of that can be explained by population growth, but it would be less than half of the increase of almost 10 million people not considered to be in the labor force. If we looked at a chart of those counted as being in the labor force, we would see that it is roughly where it was back in 2007, yet there has been working-age population growth of at least (my guess) 5 million. 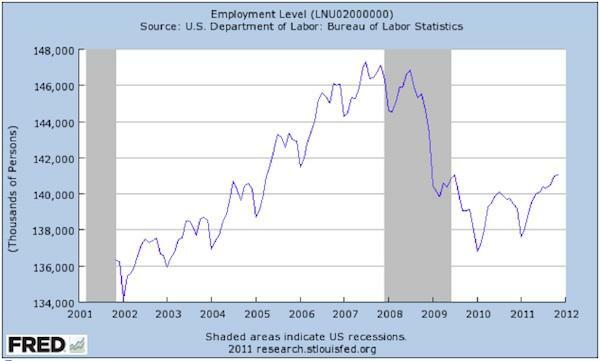 And the next chart shows the number of people that are actually employed, private or government, full- or part-time. What we see is that the number of people working is about where it was 8 years ago. That is not a pretty chart. What all that means is that unemployment would be closer to 11-12% if we went back to the labor force of just a few years ago and adjusted for population. Let me quickly note, too, that if we went back to the unemployment measurement basis of a few decades ago, the numbers would be closer to what I suggest above. Counting unemployment the way it is currently done allows whoever is in charge to publish numbers that look better than they are in reality on the street. I expect Republicans to point this out in the next election cycle, although if they get into office they will have to live with that analysis when it comes back to haunt them in four years. 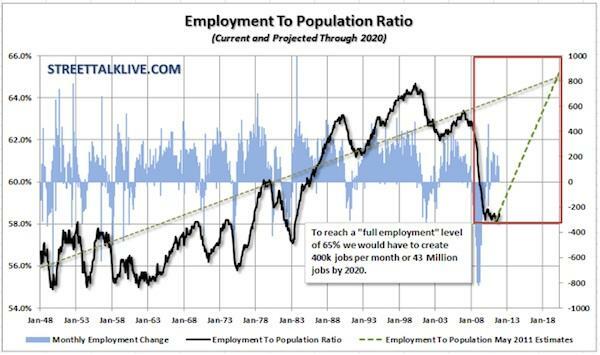 Because as the next chart shows (from my friend Lance Roberts of Streettalk Advisors in Houston), we need job growth of about 400,000 jobs a month to get back to the long-term trend by 2020. This shows the employment-to-population ratio, which has dropped by 6% since 2000, falling precipitously since the beginning of the recession. We have never had such strong employment growth, and are unlikely to get it as we reduce government spending, which we must do. This shows above all else why the #1 issue for the coming elections will be jobs. The US economy is looking more and more European all the time in terms of unemployment numbers. If the course is not changed, it will make any real recovery back to what we think of us "normal" for the US highly problematic. This does not bode well for consumer spending. Any growth of late has come from a reduced savings rate, as income is barely keeping up with inflation; and if you look at the inflation we "feel" in healthcare, food, and energy, then the average consumer is losing ground. This also means any recovery is only one external shock away from slipping back into recession. How fragile is the recovery? 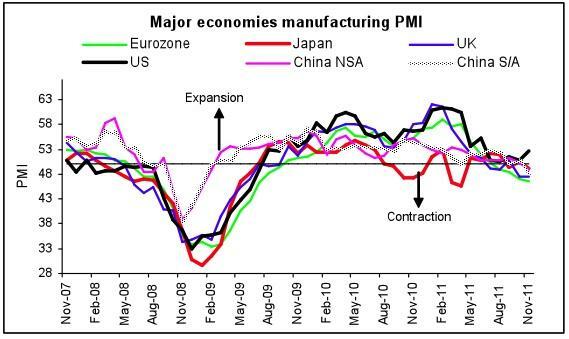 The rest of the developed world is either in recession or soon will be. Now, let's look at more details, provided by SISR (sadly, I lost the email of the person who provided this, so I can't credit him). 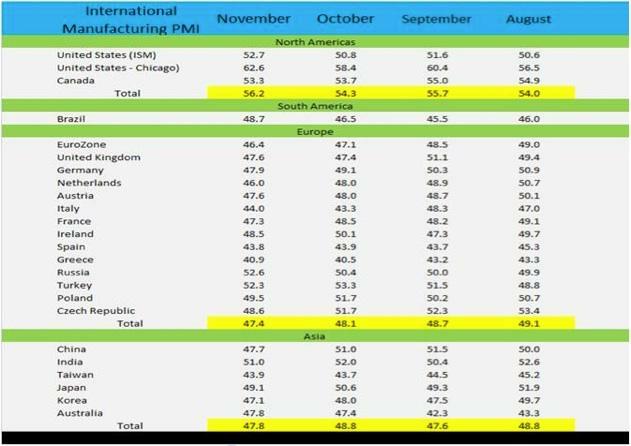 It shows that outside of the US and Canada, the rest of the developed world is watching their PMI (manufacturing production) numbers go into contraction. Of the emerging world, only India and South Africa are growing. Notice that the contraction in both Germany and France is getting worse month by month. How long can the US resist a global slowdown? My answer would be, for longer than you might think, absent the potential shock coming from Europe. But the above data does set the stage for the rest of the letter. Now, a few quick observations. This was truly a global effort by the central banks of the world (the US, Europe, Japan, Switzerland, Canada, and China). But then, what else did you expect them to do? Their main tool is to provide liquidity, and that is what they promised. They lowered the cost of coming to the "window" and certainly lowered the "shame" factor in doing so. Going to the central bank could be seen as a sign of weakness and, at higher rates, banks might be reluctant to do so. At the new rate it is reasonably economical, and the central banks have signaled it is more than OK.
Second, this effort also included China, which cut its bank reserve requirements by 0.5%. David Kotok pointed out to me something unusual about this. Normally, China makes it moves with a number ending in "7," like 27 or 47, as 7 is good luck. For those paying attention, this was China's way of saying "We are part of the team," rather than acting on their own, as they usually do. Now, it makes sense that if you include Canada in the "club" you should include China. The stock markets of the world went into an ecstatic frenzy, capping off a very positive week. But I would remind my enthusiastic friends of a few things. Let's look at what really happened. We just recovered from a very over-sold condition and are still down almost 7% from this summer. "JIM LEHRER: World stock markets staged a comeback today. They did so as key governments moved to support troubled banks. On Wall Street, the Dow Jones industrial average scored its largest point gain ever, soaring 936 points to close above 9,387. The Nasdaq was up more than 194 points to close at 1,844. 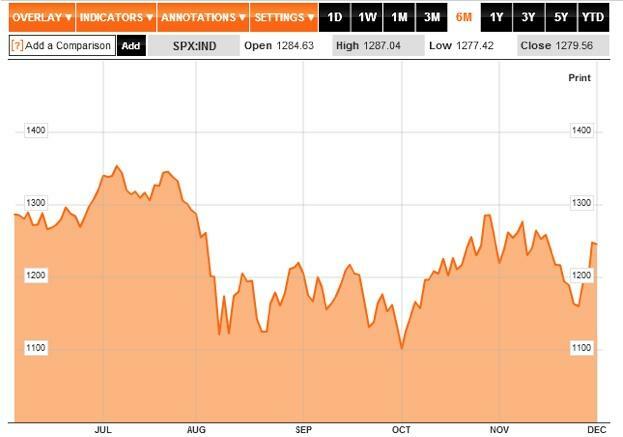 Overseas, stock indexes rose 8 percent in Britain, 11 percent in France and Germany. Markets across Asia also shot higher, including a gain of 10 percent in Hong Kong. News of European efforts to end the banking and credit crisis helped ignite the rally. On Sunday, nations that use the euro agreed on coordinated steps. Today, Britain was first to act. It was followed by Germany, France, Spain, Portugal, Austria, and the Netherlands." The good news is that this week's action may (and I emphasize may) help stave off a true bank credit crisis on the order of 2008. 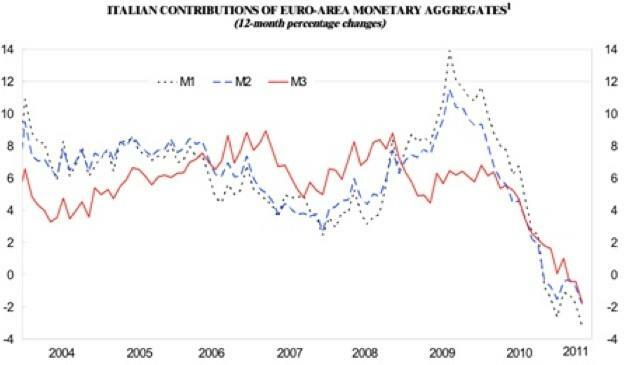 That is, if the central banks of the various European countries follow through (more on that below). The real problem was best summed up this week by Mervyn King, the governor of the Bank of England, speaking at the press conference to launch his Financial Stability Report. "Many European governments are seeing the price of their bonds fall, undermining banks' balance sheets. In response, banks, especially in the euro area, are selling assets and deleveraging. An erosion of confidence, lower asset prices and tighter credit conditions are further damaging the prospects for economic activity and will affect the ability of companies, households and governments to repay their debts. That, in turn, will weaken banks' balance sheets further. This spiral is characteristic of a systemic crisis. "Tackling the symptoms of the crisis without resolving the underlying causes, by measures such as providing liquidity to banks or sovereigns offers only short-term relief. Ultimately, governments will have to confront the underlying causes... The problems in the euro area are part of the wider imbalances in the world economy. The end result of such imbalances is a refusal by the private sector to continue financing deficits, as the ability of borrowers to repay is called into question. If the problem were one of liquidity, then this week's action would be enough. But the problem is solvency. The majority of European banks are insolvent. They own too much debt of sovereign countries that are going to have to reduce their debts. There is a growing number of analysts who are realizing that even Italy may have to reduce its debt burden. I have highlighted the problems faced by Belgium. And how about Spain, and Portugal? What this action does is give the ECB the dollars it will need to loan to the various national central banks, so they can loan to their insolvent banks. Will they bail them out, or nationalize them? The answer depends on the country and its voters. But absent recapitalizing their banks, there will be a credit crisis that will affect the whole world. The amount of debt that will have to be written off and the loan portfolios reduced, as well as new capital raised, is daunting. As I have noted previously, the need is for around €3 trillion. Writing off so much debt in the midst of a recession, coupled with austerity moves, will be massively deflationary for the eurozone. But Merkel and the German Bundesbankers have made it clear that they will not be part of any "printing press" action that is not coupled with serious commitments for balanced budgets. Even in the face of a recession. "They have indeed, and we've no problem with what he said for that is indeed the truth. Then, however, the plates shifted when he said, noting that the ECB's mandate, that price stability is to be maintained ‘in both directions.' In other words, the ECB's mandate forces the authorities to be concerned about deflationary risks as well as those inflationary. "Did you hear the plates shifting? You should have for they have indeed shifted. Draghi's warning was that the authorities are just as concerned about deflation as inflation and that monetary expansion is to be considered just as has monetary contraction. "So we are now… or shall soon be… faced with a monetary and political union that is manifestly different than that which the original united nations had signed up for AND we have a central bank intent upon fighting deflation as strongly as it has fought inflation. These are the attributes of a regime intent upon weakening, not strengthening, its currency in order to strengthen the economy and to save the union… if at all possible." The coordinated central bank action will make dollars available to the ECB, which will in turn loan them to the national central banks, which presumably will loan them to their in-country banks, taking lower-quality collateral than the ECB (which under the rules they are allowed to do). Given the deflationary pressures that are the natural result of a recession and deleveraging/default, they can print a lot of money without igniting too much inflation. But I agree with Dennis; I just don't see how they can do so without seeing the valuation of the euro fall rather smartly. Merkel and Sarkozy have told us they will meet Monday and announce a plan on December 9, when the full eurozone meets. Forget bazookas, this needs the equivalent of a howitzer. They are seemingly intent upon rewriting the treaty, which is the only way that the Germans will go along with any major ECB action. But by my reckoning, a few hundred billion, or even a trillion, is not major action, at least not on the level of what will be needed. The price for German acquiescence will be a loss of sovereignty and the ability to run deficits of any real size for any appreciable length of time for the countries of Europe. Will the peripheral countries go along? Heck, forget them; will Finland go along? This situation has been coming along since the foundation of the eurozone. The early founders acknowledged that a tighter fiscal union would eventually be necessary if the euro experiment were to survive. And eventually is now. As in this month. Time is running out if they want to forestall a credit crisis that would be worse than 2008. The world is watching, as what happens in Europe will affect us all, in every part of the globe. It could easily tip the US into recession, and it will only be worse for the emerging markets. For Europe, the Endgame is now. We can only hope they come up with a plan that avoids disorderly defaults and a crisis far graver than 2008. They have no good choices, only difficult ones and disastrous ones. Let us hope they choose wisely. I am reading Niall Ferguson's new book, Civilization. It is a great read. Quick note: If you enjoy Niall's writing, you may also enjoy watching his TV series on 4oD: The Ascent of Money (same name as his early book). He presents six 1-hour episodes. Only 11 days left on the website, a good idea for this weekend! Niall, along with Marc Faber, David Rosenberg, Mohamed El-Erian, Woody Brock, Lacy Hunt, David McWilliams, and your humble analyst, will all be at my conference (co-hosted with partners Altegris Investments) May 2-4 near San Diego. Does this not sound like the best line-up of any conference this year? Details will follow, but you won't want to miss this one. I am more or less home for the next six weeks, except for a quick trip back to New York later this month with Tiffani for a business meeting (good changes are coming, as always), and we will take some time to enjoy friends and the city lights. Then I will go to Hong Kong and Singapore on January 10 for 12 days, coming back to finish a few things and then head off to Cape Town, South Africa in the middle of February (details later). Tomorrow I go with Tiffani to take my granddaughter Lively to go see Yo Gabba Gabba "live." This is a new kid's show for very young toddlers that captures their attention like nothing I have ever seen. Below is a photo from last spring, when we were on a plane to somewhere (Lively is now a seasoned traveler!) 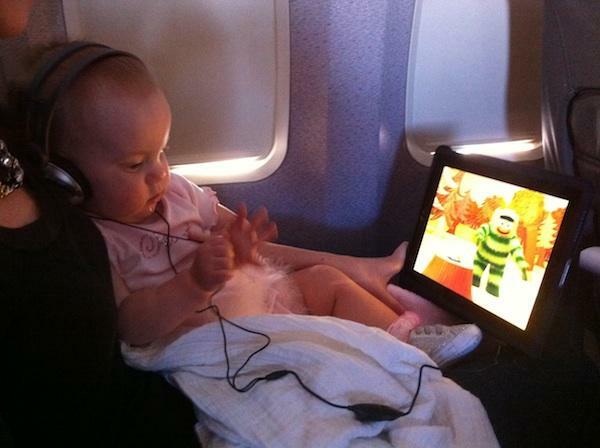 and she was watching Yo Gabba Gabba on an iPad with her special baby earphones. Look how rapt she is. "Papa John" gets to sit in on this and even go back stage to meet with the cast. Wild horses could not drag me to endure this with your kid, but with my granddaughter? Try and keep me away! How we change with the advent of the next generation. All Dad wants for Christmas is to meet his deadlines for the irrational amount of writing I have committed to do before I leave for Hong Kong. That and to have my kids around. It is time to hit the send button so the translator in Hong Kong can get started. In theory, no more really late nights on Friday for me. But this letter has been more than long enough. Have a great week.